Deep thoughts from the 19th hole. Ok, fine, there’s really only one way to spend St. Patrick’s Day. But where you decide to down that unsaintly amount of barley juice and belt out the ol’ Tone Loc can vary. And while Scotland, Ireland’s Celtic kissing cousin across the sea, may be the birthplace of golf, the Emerald Isle has some pretty hefty golf chops of its own, especially as far as Dublin is concerned. Portmarnock, Killeen Castle, the Royal Dublin—not a bad place to work on your swing, to say the least. But what about that decidedly Irish 19th hole on the way back to the hotel? That place where you say, “Let’s pop in for a quick pint,” only to realize that it’s suddenly two a.m., your shirt has vanished alongside your dignity, and you’re challenging the fish and chips lady to an arm wrestling match for a plate of free haddock? 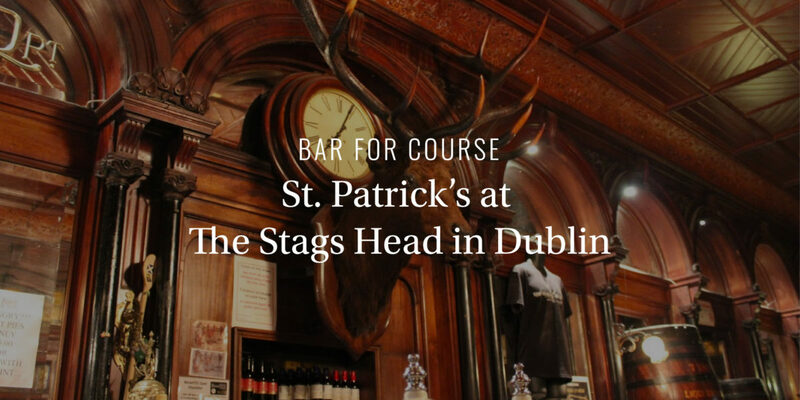 Well, there is no shortage of places in Dublin where you can be overserved as such, but for our money, you can’t beat the Stag’s Head. Tucked in an alley just a stone’s throw away from Grafton Street, this classic pub (dating back to the 1770s, in fact) has wood paneling, taxidermy, and whiskey galore. In fact, there are barrels of the latter around the bar—one of which Michael Collins supposedly drank from back in the old days. According to legend, they called it “Mick’s Barrel,” and kept it on hand just for him. Now, don’t expect to have a barrel of whiskey named after you anytime soon. But you can drink it right from the cask just like the Irish heroes of legend. There’s a barrel of Powers Whiskey mounted on the wall, and the bartenders at the Stag’s Head are not shy about serving it. Word to the wise: “pole position,” as it were, right next to the barrel, gets taken quickly, especially on St. Patrick’s Day, so plant yourself beside it and do not budge. It’ll be two a.m.—and time for some fish and chips—before you know it. Copyright © 2016 Criquet Shirts. All rights reserved.